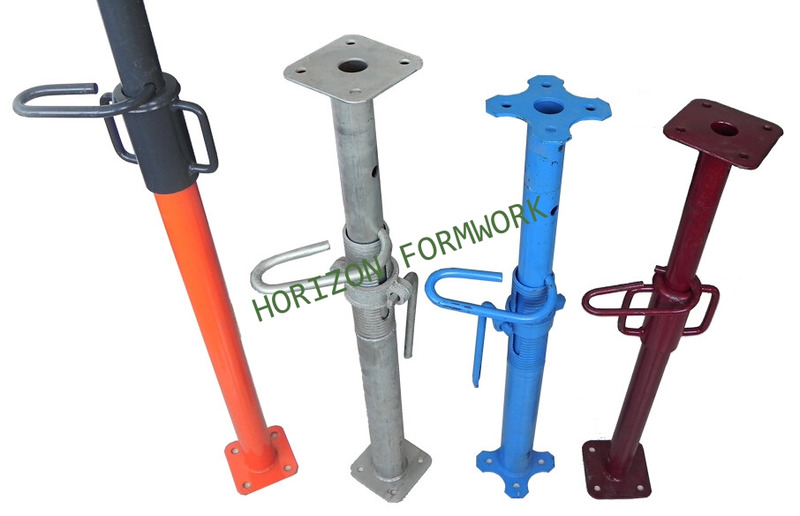 Galvanized prop is another important scaffolding component of HORIZON formwork system, especially in the slab formwork. With the prop’s high loading capacity, low weight and stability, HORIZON slab formwork works safely and efficiently on site as well as cost-effective. Also, the prop is fast and easy for handling on site. 1. High quality steel tubes ensures its high loading capacity. 2. Various finishing are available, such as: hot-dipped galvanization, cold galvanization, powder coating and painting. 3. Special design prevents the operator from hurting his hands between the inner and outer tube. 4. The inner tube, pin and adjustable nut are designed protected against unintentional disengagement. 5. With the same size of the plate and base plate, the prop heads are easily to insert in the inner tube and outer tube. 6. The strong pallets ensure the transportation easily and safely. 7. Can match well with doka or peri systems.